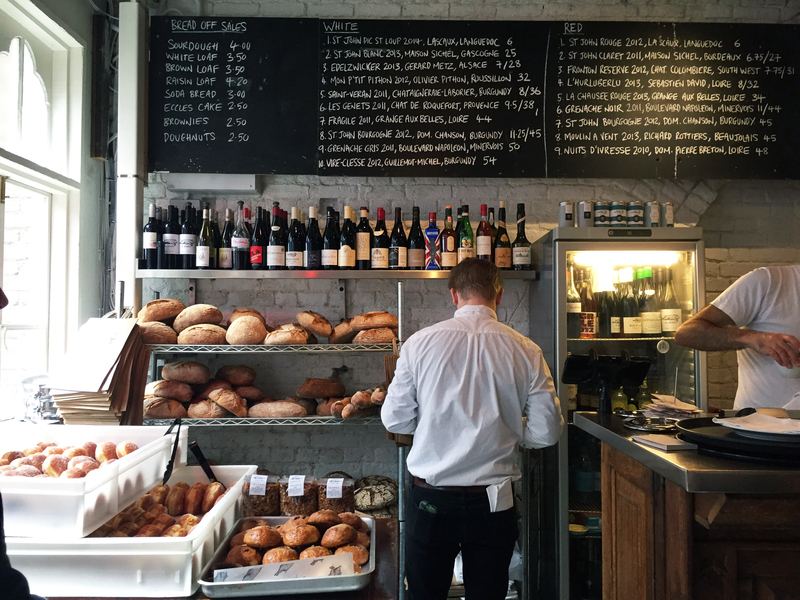 If it’s a Saturday or Sunday, food lovers seem to all flock to Maltby Street where vendors setup shop under the arches of a raised train track. St John Bakery has a permanent shop here, where you can sit down and taste all sorts of creative plates. 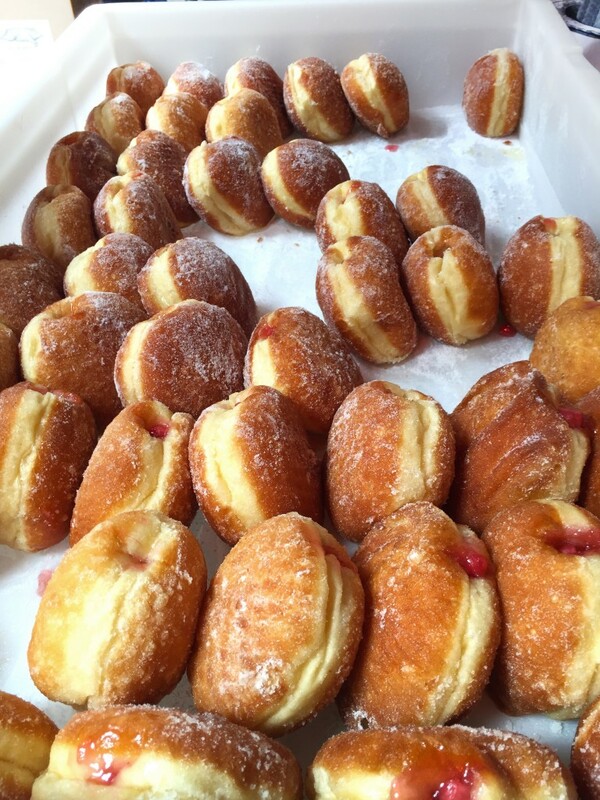 But the winner here is what most people have for pudding (dessert) and I have for breakfast, which are their donuts. 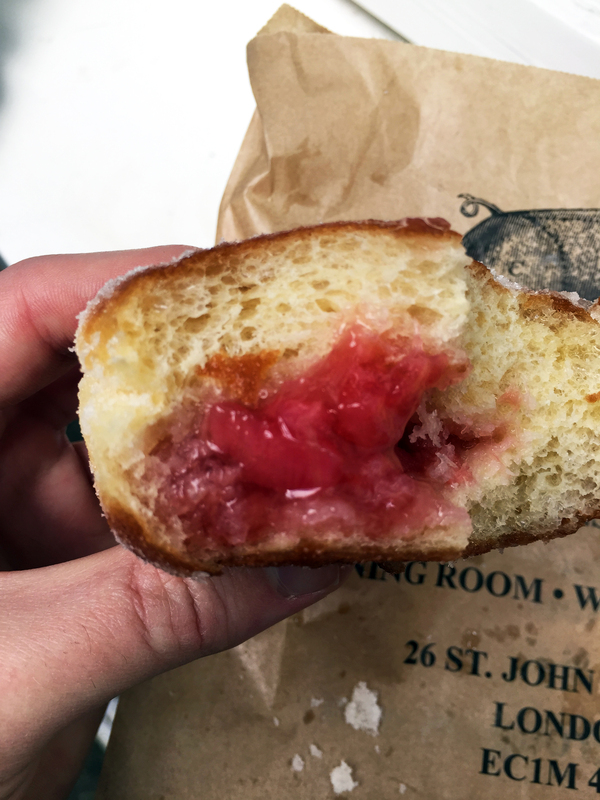 Even with the still recent departure of their head baker, Justin Gellatly, who went to start Bread Ahead, St John Bakery still crank out some fluffy, delicious, filled donuts. I went with the classic vanilla specked custard and the seasonal rhubarb jam. 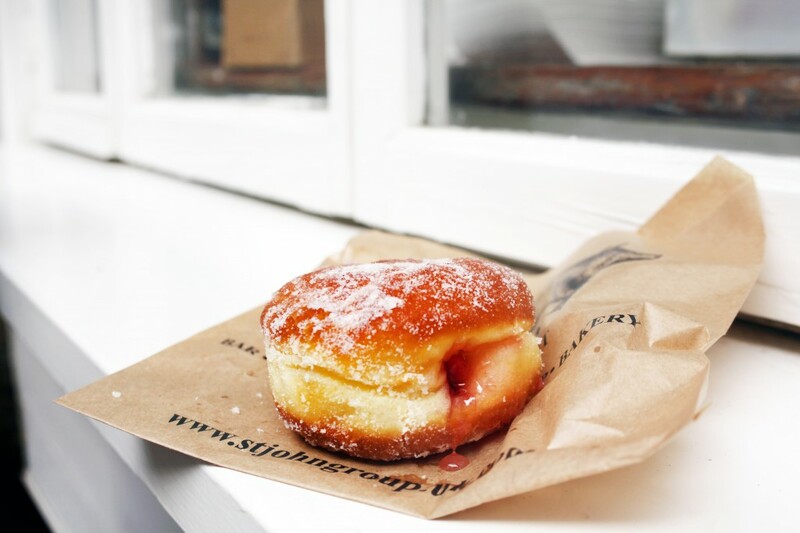 The donut itself was very light and airy, leaving room for the massive injection of filling in the middle of it. I didn’t mind it, since the filling here is the centerpiece of the donut. And it was nothing short of fresh. The rhubarb jam had a mild strawberry flavor and was immediately addicting. The jam was fresh and flavorful and I would order it again in a second. 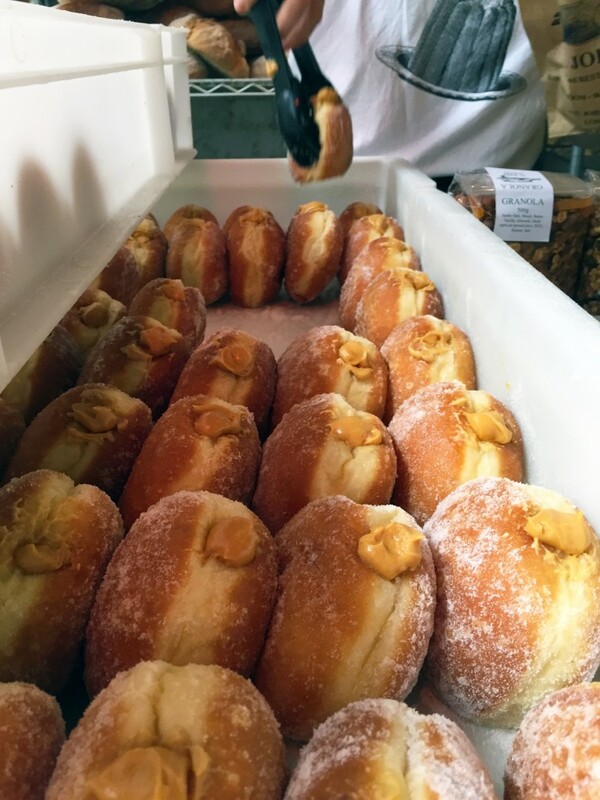 Both donuts were covered with granulated sugar on the outside, which wrapped it all together and added a nice texture to the rich and creamy inside. It’s evident by the freshness and the amount of filling in each that these were all made by hand, void of any massed produced-ness. 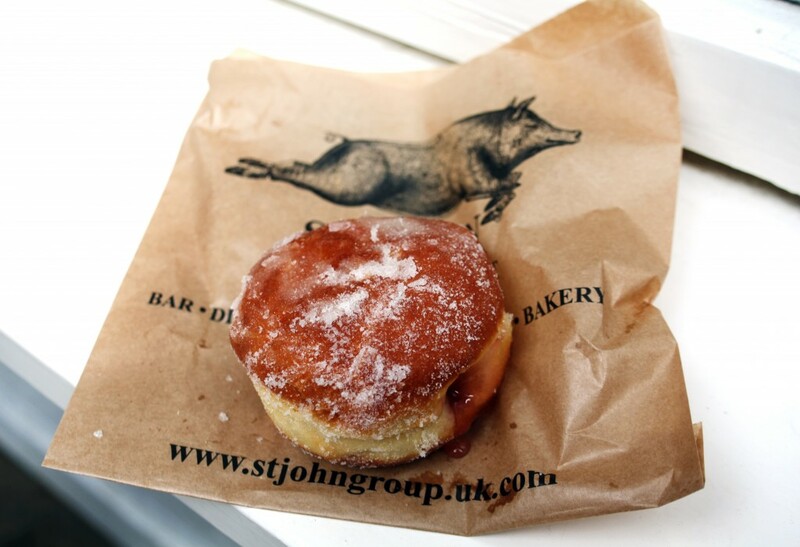 St John Bakery is worth the trek and the amount of napkins it will take to get your sticky face clean.